If you have any further knowledge of any of the images posted, please let us know – Email mark@untoldhorror.ca with any details you may have about these projects! In digging into this one, let’s start with the title: TASHMAD. 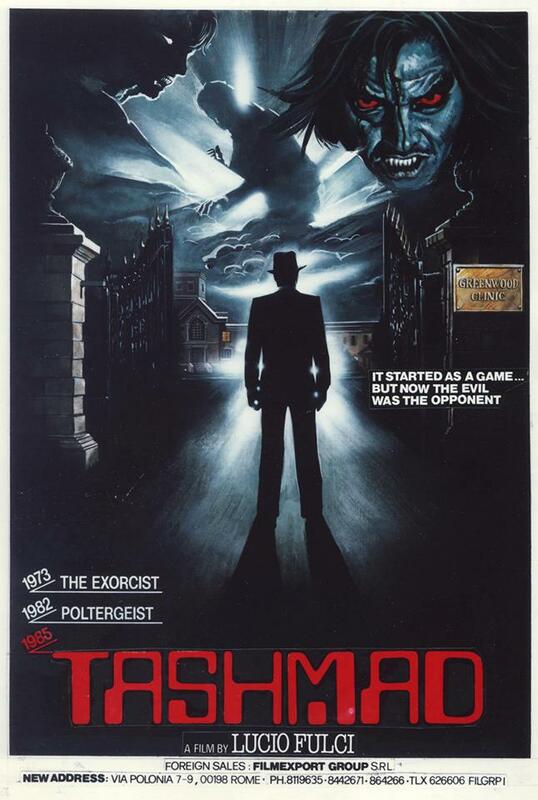 So, taking this bit of knowledge and combine it with the the below pre-sale artwork and stated cinematic comparisons to The Exorcist and Poltergeist, one can only assume that this was some sort of end-of-the-world scenario, religious horror film. 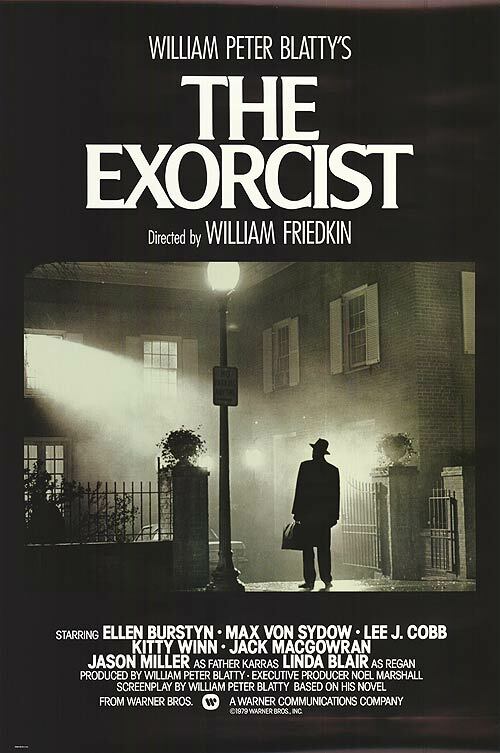 Besides literally citing the film, there are certainly more than a couple of similarities between this artwork with the iconic poster art for The Exorcist as well. IT STARTED AS A GAME… BUT NOW THE EVIL WAS THE OPPONENT. If you find yourself reading that over several times you’re not alone. I’ve read it well over a dozen times, and the changing from past to present back to past tense is way more jarring than it should be. But perhaps this all makes sense when we get down to the director behind the attached filmmaker… Lucio Fulci. Fulci, director of genre classics like The Beyond, Don’t Torture a Duckling, Zombi 2, New York Ripper, and many more, is among the Unholy Trinity of Italian genre cinema, along with Dario Argento and Mario Bava. With Fulci in mind, it should be of some interest then that some sources list this film as La Casa Sull Hudson. Which translated from Italian is The House on Hudson. So knowing that, one could imagine a New York City setting. 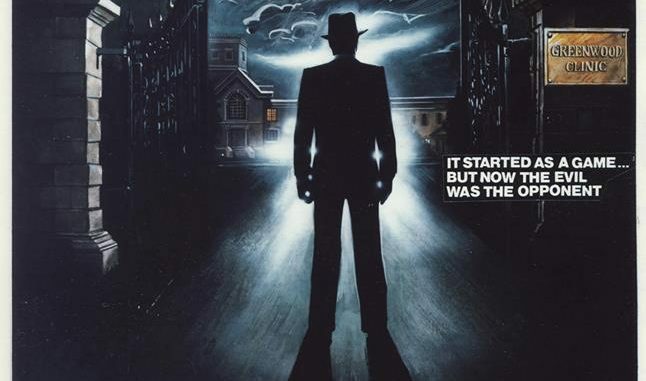 Would this 1985 film have sat as some sort of New York City-titular trilogy along with both of 1982’s slasher New York Ripper and the supernatural shocker Manhattan Baby? Regardless, Fulci had covered all sorts of terrors in his filmography, from zombies, to serial killers, to ghostly nuns, to monsters in the basement, to killer cats, and nearly everything in between. However, it could be argued that he never made a traditional “Haunted House” film. Would Tashmad have been just that – Lucio Fulci’s stab at a haunted house film? A likely maggot-filled, gross-out, eye-ball piercing, nightmare logic, fun house of a haunt film – but still his take the sub-genre nonetheless? A take that I know I personally was one we could have experienced.